The body of a 14 year old Ahwazi Arab resident of Hay al-Thawra (Dayereh) was found in the Karoon River last week. 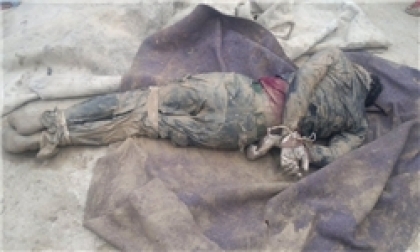 Pictures of Maitham Hamid Abidawi's corpse show that his hands were bound behind his back and his feet were tied together. A rescue team was deployed and allegedly found other bodies in the river, according to the Media Center of the Ahwazi Revolution. The bodies of many Ahwazi activists who have "disappeared" have been washed up in the Karoon. Last September, human rights activists reported that the body of Abbas Sawari, arrested in April 2011, was found washed up on the shore of the Karoon. Sawari was arrested after participating in demonstrations in the Hay al-Thawra district commemorating the sixth anniversary of the Ahwazi Arab intifada. Extra-judicial killings of low-level Ahwazi Arab activists are believed to far out-number official executions.